Gold Plated Necklace with 6mm Faux-Pearl Beads & Saint Sebastian/Wrestling Charm. 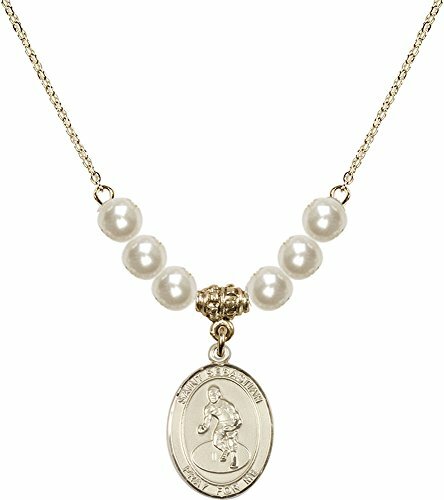 18-Inch Hamilton Gold Plated Necklace with 6mm Faux-Pearl Beads and Saint Sebastian/Wrestling Charm. Rhodium Plated Necklace with 6mm Peridot Birthstone Beads & Saint Sebastian/Wrestling Charm. Rhodium Plated Necklace with 6mm Ruby Birthstone Beads & Saint Sebastian/Wrestling Charm. Gold Plated Necklace with 6mm Light Rose Birthstone Beads & Saint Christopher/Wrestling Charm. Rhodium Plated Necklace with 6mm Light Sapphire Birthstone Beads & Saint Christopher/Wrestling Charm. 18-Inch Hamilton Gold Plated Necklace with 4mm Emerald Birthstone Beads and Gold Filled Saint Christopher/Wrestling Charm. Gold Plated Necklace with 6mm Gold Filled Beads & Saint Sebastian/Wrestling Charm. 18-Inch Hamilton Gold Plated Necklace with 4mm Light Rose Birthstone Beads and Gold Filled Saint Sebastian/Wrestling Charm. Rhodium Plated Necklace with 6mm Amethyst Birthstone Beads & Saint Sebastian/Wrestling Charm. Gold Plated Necklace with Light Sapphire Birthstone Beads & Saint Christopher/Wrestling Charm. Gold Plated Necklace with 6mm Ruby Birthstone Beads & Saint Sebastian/Wrestling Charm.